Carved out of a plateau of lava in the Chikushi region, the double-drop Ryumon Falls measures at 26 meters in height, 40 meters in width. The location is a known scenic spot for greenery .Of course, the water in the falls feels just as wonderful. Reach out and feel the cool and crisp water falling on your hand. Soak your feet and let the cool, tingling sensation of the water spread throughout your body. If you want to join the summer crowds, remember to bring your swimsuit. You’ll also need a mat to be placed under your body, but that can be easily rented from the local store nearby. Sliding down Ryumon Falls is a real thrill. At a distance of about 122 kms from Iwaki city lies Nasu Karasuyama city. This city is located in Tochigi prefecture and is about a 3 hour drive from Iwaki city along Highway 6 . 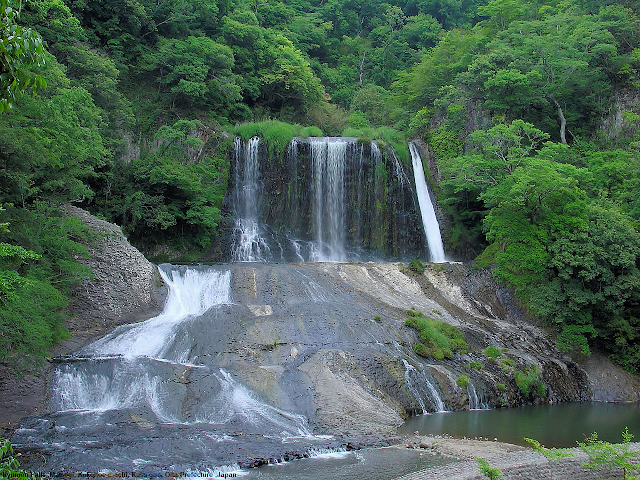 Nasu Karasuyama’s most popular tourist attraction is Ryumon Falls.